The Sierra de Aracena is well provided with a valuable industrial heritage of the XIXth and XXth centuries. Unfortunately great parts of it are in state of abandonment. The sad fate of these buildings is closely linked to its purpose, once their economic life is over only the inexorable passage of time awaits them. Its preservation requires an integrated approach that goes beyond the limits of conservationism. Returning a real and sustainable value over time to these buildings not only stops its decline, but safeguards an essential chapter and returns the building to its original function: the generation of wealth. 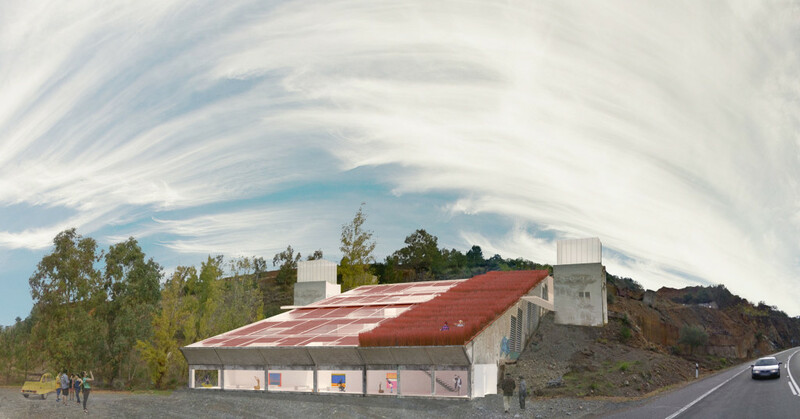 Therefore, to meet the challenge posed by the Inspiration Hotel competition we did not hesitate to choose an industrial building of the Sierra as a backdrop of the proposal. We were moved by a professional and personal commitment to rehabilitation, which is today a duty rather than an option. It didn’t took long to choose this fascinating and unknown site. Whoever drives to Badajoz, just before arriving at La Nava, might have felt the same estrangement when facing without notice, after skirting a hill, this strange artifact perching on the hillside as coming from another place, another time. It is the María Luisa Mine, once a bustling center of copper and iron mining. When the extraction ceased to be profitable the fate of the building was sealed. Abandoned overnight, it is said that the floors were soon papered with the documents the technicians left behind. The resort suffers the added stigma of belonging to a period, the second half of the XXth century, generally unappreciated. But whoever takes some time to study it will soon recognize the merits of an atypical architecture. 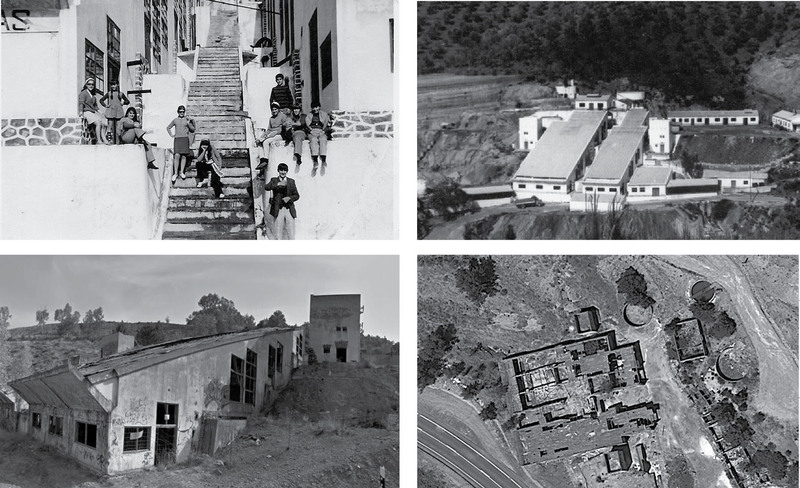 Vintage photographies, generously provided by the Asocaciacón Lieva, take us back to a facility with dimensions of village, showing a scale much larger than what the ruin itself suggested. Time and the construction of the new road significantly reduced the complex, barely preserving the structure of walls and pillars and part of the roof. The main unit, austere, yet resisting, along with the two towers that flank it, constitute the perennial witness to times of greater splendor. The building, built in the hillside next to the river Múrtiga, focuses its views to the depth of the valley. For its configuration and location the ruin was ideal to host the creative refuge for artists that the Inspiration Hotel competition invited to imagine. 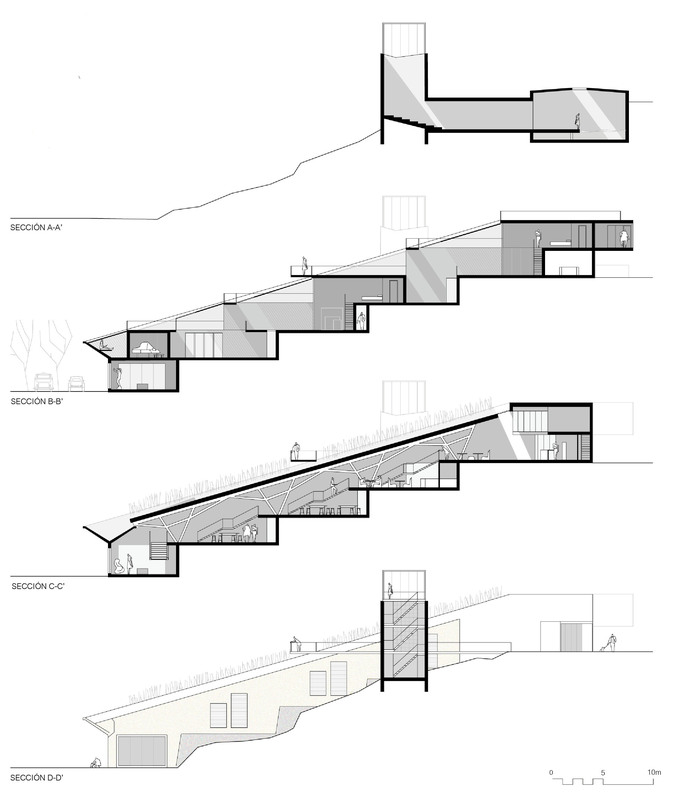 Despite being subject to space restrictions, every doubt dissipated as the proposal advanced. Quite naturally, as the building revealed itself, it pointing out one by one the keys of the intervention. As if moved by a canastero that weaves wicker, every piece found shelter between the guidelines of the building. 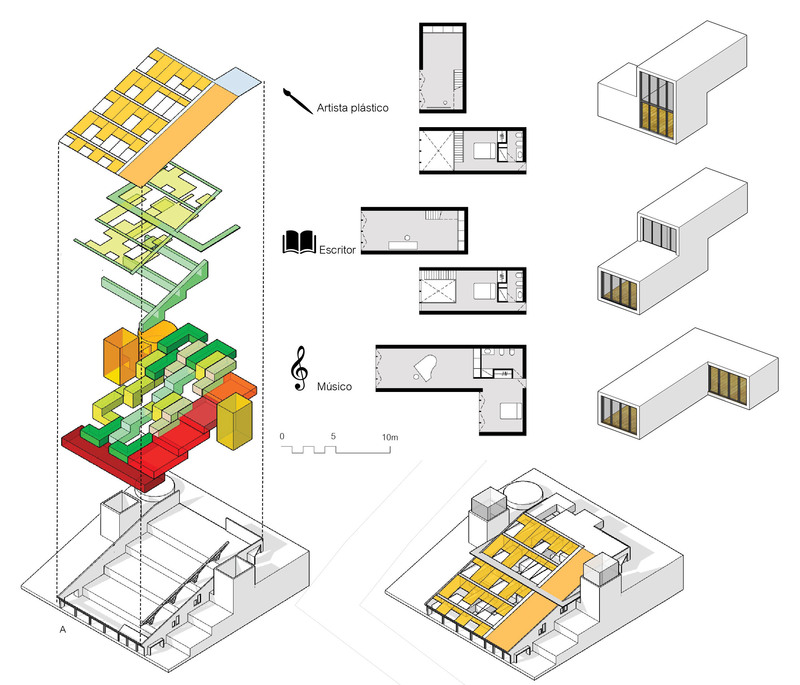 Each original space seemed to imply in shape, size and character uses expected by the competition program. Addressing a proposal with the ambition of Mimbres Libres invited to act from simple organizational schemes. Thus the project is explained in just three keys. The first comes from staggering: every part is mounted on one another and orientates towards the valley. The second is the division into two units, the narrowest, with a splendid original concrete portico is ideal to locate all the community spaces in a continuum that ranges from the gallery to the hotel lobby. The studios in which artists reside occupy the space of the wider unit and the central old staircase. Contrary to a more even distribution, every studio is marked by the character of its inhabitant: artists have the brightest, musicians the most spacious and writers with the most conducive to meditation spaces. Their grouping produce patios and terraces overlooking the valley providing a new additional level of spontaneous socialization. The third key is brought by the turrets, which are reserved for seclusion. 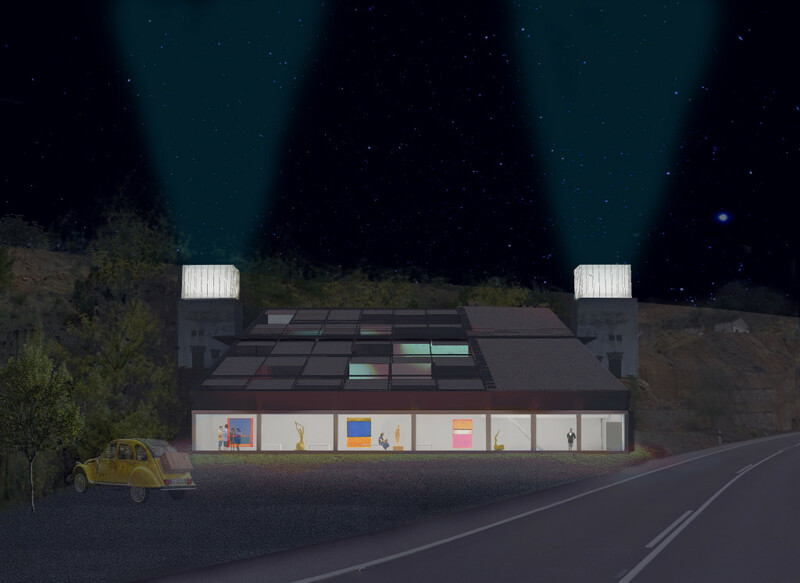 To the south, the library, with a small projection room and a reading vantage point on the top. To the north lies the silence room, a sequence of spaces, light and dark, which predispose to abstraction. Bringing a building back to life also offers the opportunity of resuming lifestyles from a new perspective. 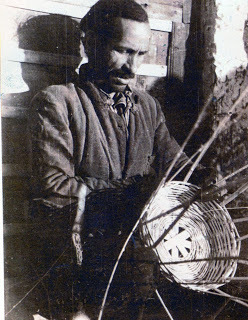 The proximity of the Múrtiga, where you can grow wicker, offers the possibility of resuming the noble folk craft of basketry, which in association with the inventive spirit of artists and designers favours a creative interaction that would result in both unique objects and useful elements (lamps, furniture, household utensils …). The synergy resulting from the reinvention of a place and a livelihood, together with good management and a quality product, provides a path of viable possibility facing the important challenge of retaining future population. Today, the connections between design and folk crafts gather international recognition for its social background and commitment to fair trade. The imprint of this conviction is marked in the building, to the point that the cover itself is an extension of wicker fields. Its colorful crops, ochres crimson, not only distinguish the complex in the distance, but turn the vegetation cover in a living and productive space at a time. Moreover, the excellent accessibility of the building, allows the resulting artwork to be easily exposed in the gallery at the lower level. This is of course a theoretical exercise, but nothing in it is unfeasible. The scheme here proposed is perfectly a perfectly adjustable sample of what could be achieved if the administration, the private sector and our splendid heritage is put at the service of a social function sensitive to tradition, vanguard, and an economy committed to culture.